Simon Whitlock faces crucial matches against both Michael Smith and Daryl Gurney on night 12 as he battles to keep alive his play-off hopes following a 7-3 defeat against an inspired Raymond van Barneveld on Wednesday evening. Whitlock starts the evening four points adrift of fourth placed Michael Smith so a defeat here would increase the gap to six points with only four matches left to play for the Wizard, whereas a win against Smith followed by a victory over Gurney would see Whitlock move level on points with Smith. Whitlock has won only one of his last eight Premier League matches and he has averaged under 90 in each of his last three PL matches. Michael Smith remains in a very strong position to make the finals night despite having lost each of his last two Premier League matches. Smith currently occupies fourth place in the table and is three points ahead of fifth placed Daryl Gurney. A victory here would give him a five-point lead over Gurney who has two matches to play on night 12. Last night in Rotterdam he was on the end of a darting masterclass from Gary Anderson; Smith lost 7-2 with Anderson posting a 2018 Premier League tournament high match average of 110.83. 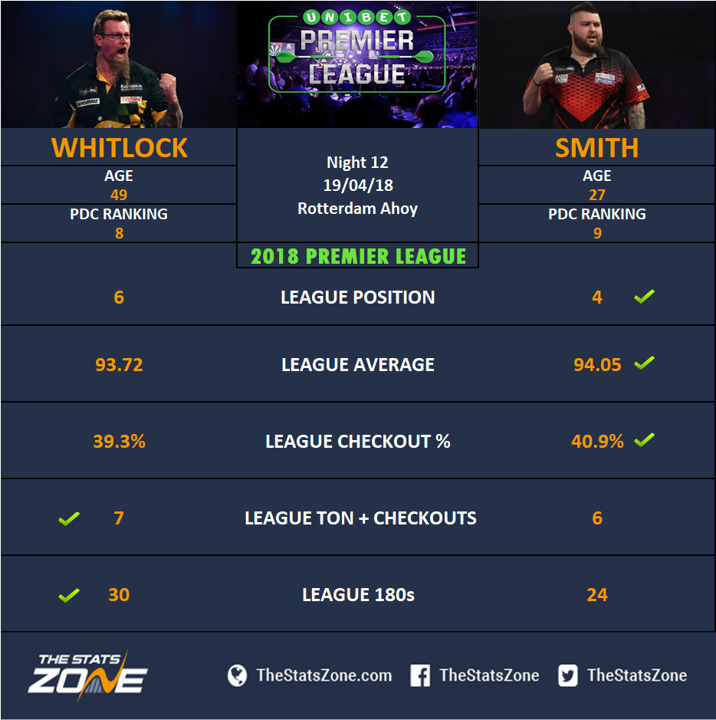 When Whitlock and Smith met on night four of the 2018 Premier League they came into the match having both started the season with three wins from their opening three matches, and it was Smith who came out on top, winning 7-3 in a scrappy encounter where both players finished with sub-90 match averages. Both players come into this game having lost their last two Premier League matches but it is Smith who is in the much better shape in terms of league position. The St Helens man has only lost to Van Gerwen, Anderson and Cross during the 2018 Premier League season and there was not much at all he could do about his thrashing from Gary Anderson on Wednesday night. Whitlock’s only win in his last eight Premier League matches was against a struggling Gerwyn Price and his recent displays have been well below his form earlier on in the campaign. Smith looks capable of taking the two points in this encounter; he is playing to a higher standard and has more belief, and a win would take him a big step closer to an appearance at The O2 in May.